Out with a huge bang, not a whimper in sight!!! = PART 2! The last two meetings in Cali were both totally memorable, for the demonstration of the glory of God, and his power. Andrew’s morning was a testimony in itself, in that many were healed, culminating in the amazing situation with Victor, and his ‘ejection’ of the tumour, ending his terminal stomach cancer. As time was tight, I got people to stand for a variety of more ‘regular’ illnesses, and, to confirm the last blog, a high percentage of people knew that they had been healed, while many of the others experienced heat, tingling, pins and needles – things often associated with God beginning the healing process. 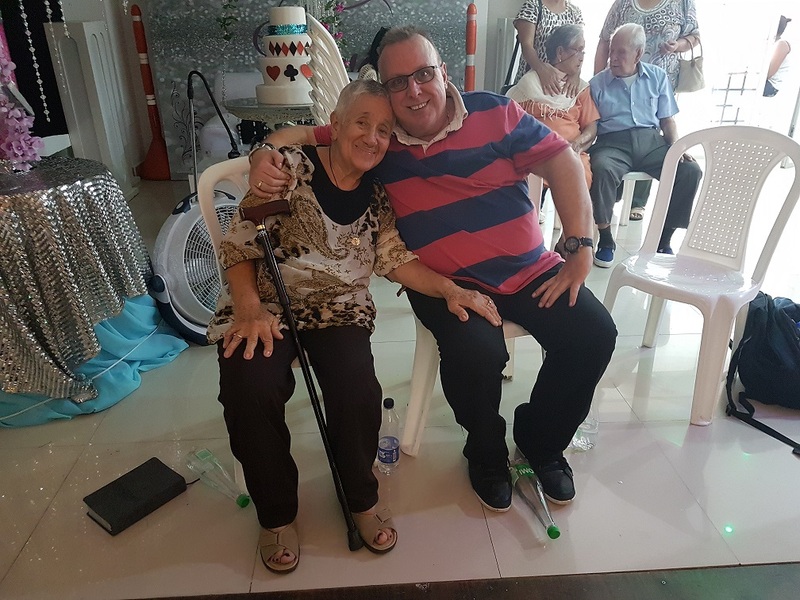 In the church Restoration Christian Community (Communidad Cristiana Restauracion), a lady with life-long back pain (I guess she was mid 50’s) through severe scoliosis, felt – so did I – her spine move, turn, and straighten. I’ve felt that many times over the years, the most amazing being a lovely young lady named Jessica, near Minneapolis, quite a few years back. The feeling of it is something quite amazing that I’ll never tire of – but then that’s still my story of healings and miracles after more than 30 years. I can’t imagine EVER tiring of God’s amazing power. Despite getting many of the folk to stand ‘en bloc’, there are always loads of people who want prayer on to one – fortunately, the pastor didn’t seem too disturbed by running way over time, even though the next event people were setting up the room for their meeting. 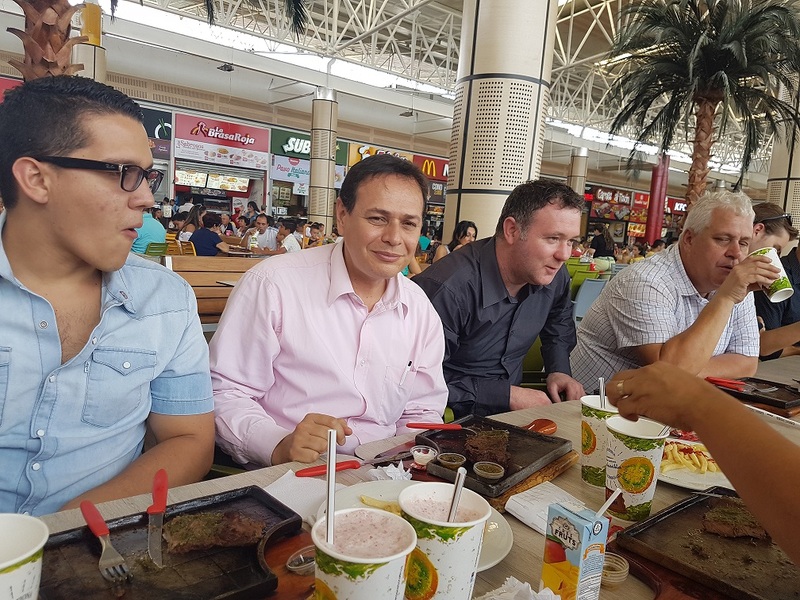 It was a real blessing to have Fabiola – see last blog – speak such amazing words of encouragement, and prophetically to me before the meeting began – and it was lovely to pray for her at the end for God to give her a special anointing of His Holy Spirit. 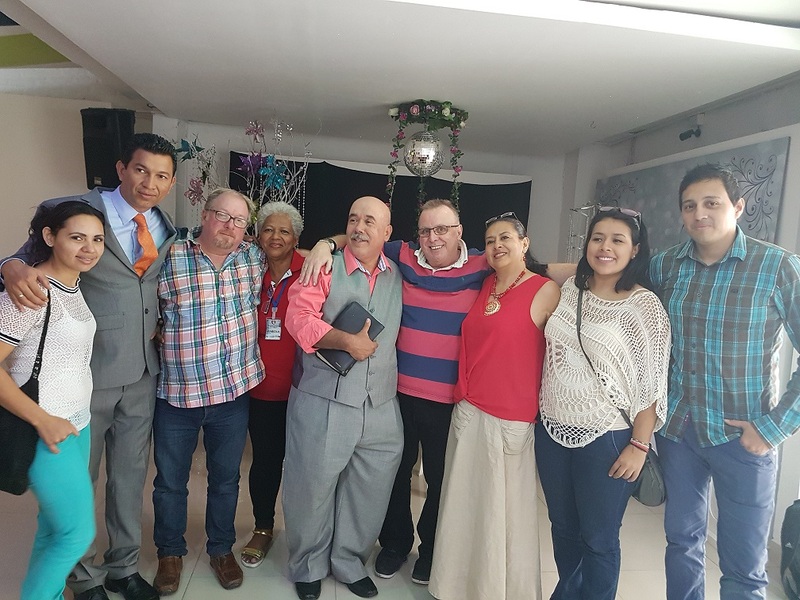 Pastors Francisco & Elena Sierra, with other leaders from the church Christian Community Restoration. God’s so good, everyone prayed for one on one for both Andrew and me, were healed – migraines, osteoparosis, osteoarthritis, IBS, and many more. I’m totally serious when I say that I’m thrilled when people with osteoarthritis – especially knees – get healed, as to know that they walk away without the pain I know only too well that they’ve lived with, is such a joy. When that dear elderly lady I mentioned got healed during my message last Sunday, to see her walk without her sticks, kneel down in front of me (not in worship, I’d hasten to add!!) – just because she hadn’t been able to do it for some decades, and now could, was such a thrill. Her face was a picture of joy, as all her other osteoarthrtic pain went, too. I’ve genuinely told God that, if my being healed of it (and, in time, forgetting the pain of it) means that others stop getting healed of it because my memory of the pain has gone, I’m willing to stay with the pain, so long as he still keeps me relatively mobile!! It was a blessing while I was there to have some treatment from the same doctor as last year: and then a course of muscle relaxing injections from a nurse – Maria Helena Bugui – which I can’t seem to get from my doctor, but that make such a phenomenal difference. I’m on the lookout for a nurse who might be willing to stick a syringe in me for a few days, now I’m back in the UK and before I head to France next Tuesday, for 3 weeks (to do the same, pretty much, as in Cali: though no team this time, but alongside missionary friends Colin & Sue Enticknap, on the Vendee, and Elisa and Gerard Zeitjens in Rouen) with that medication, so that my muscles have a good ‘reservoir’ of it to keep flexible – it’s actually the muscles that make the mobility hardest for me. At the moment, the muscles are doing pretty well….but another few days’ worth of darts into a muscle will be so valuable. It was wonderful praying with the pastor, Francisco, and his wife Elena, and daughter Elisabeth, at the end of the morning: a measure of physical healing was received, and some prophetic words of encouragement given to them. A very dear couple indeed…. So, post-lunch – a final steak to leave on a ‘high’ (!!) 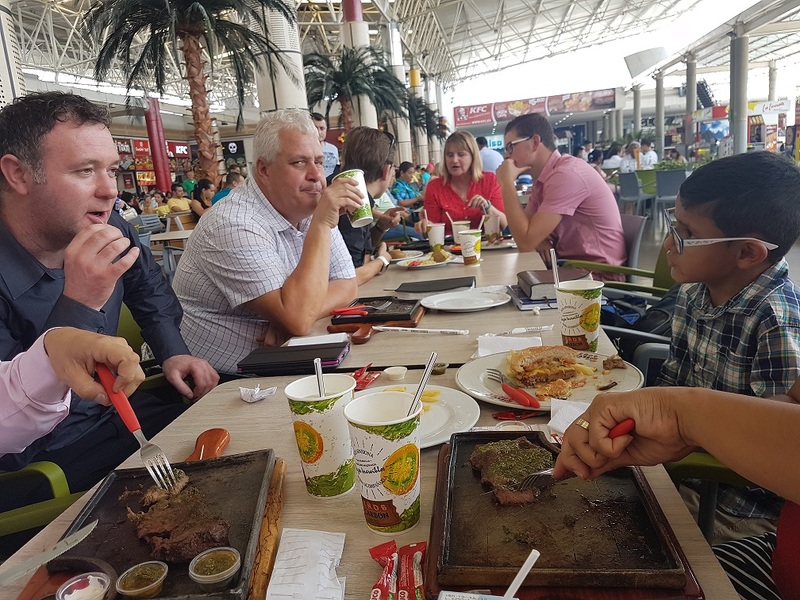 at the wonderful restaurant ‘Lenos & Carbon’ – just a shopping mall food court restaurant – and inviting various people who had blessed us during the trip, and on that Sunday…. 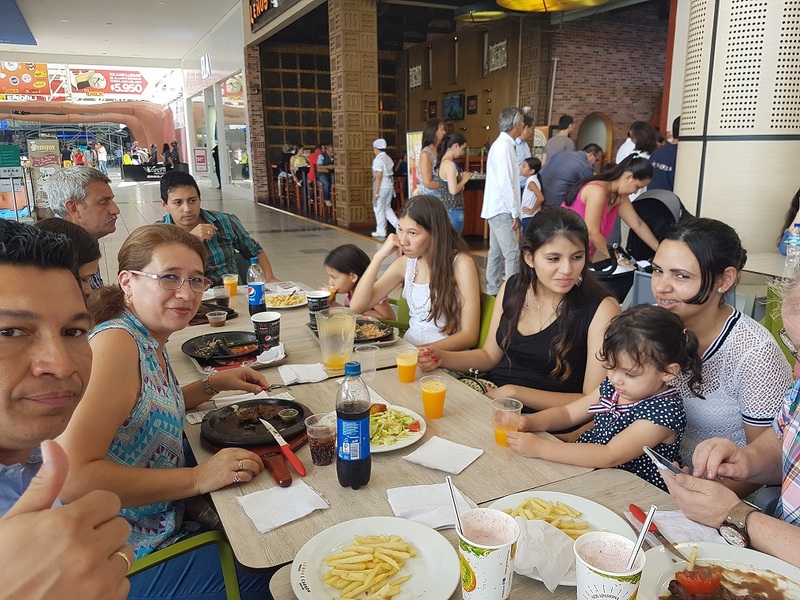 Wilmar & Marlene Gomez, and their lovely daughters Sophia and Sarah, Johan & Laura, and their lovely daughters – who did so much translating for us, and Hernan & Aida Gonzalez, whose church Adrian and Davy were in on Sunday. They are an adorable couple, with an adorable son, also Hernan, and their church is in such a poor, dangerous area. It makes it so worthwhile taking them to lunch – a simple and hardly over-generous gesture: and when you have Hernan & Aida tell you that they’ve never eten in a place like it, or food like it, it’s utterly humbling. They were so grateful, and so blessed. « Out with a huge bang, not a whimper in sight!! !